The Ghoulish Plot: As all Asian parents know, there is nothing more terrifying than having a disappointing child. Single mother Amelia lives with her somewhat odd 6-year-old son Samuel. Samuel is not popular with other kids, is prone to saying weird things and screams his head off if he doesn’t get what he wants, although as best as I can tell from random kids I encounter they all do a lot of those things. Samuel also likes to tell people that he doesn’t have a dad because his father died in a car crash while driving Amelia to the hospital to give birth to him. Sam is a real outcast, as opposed to the cool outcast kids now purchase a kit for at Hot Topic. One evening Amelia tells Sam to pick a book to read at bedtime, and he chooses one called The Babadook, because he’s a weird kid. It tells the story of a mysterious black figure who comes to a child to try and get let into their home, and if the child refuses the Babadook will try to go to the mother and then haunt them forever. Samuel is terrified of the book and then starts blaming all his bad behavior on the Babadook, like kids do. Or alcoholics. Alcoholics do that too. It was the Whiskey! Samuel gets kicked out of school and keeps having nightmares and refuses to sleep, keeping Amelia awake for days on end and resulting in lots of people saying to her, “you look tired,” which every tired person loves to hear. She has less and less patience for Samuel and his antics and begins to fantasize about hurting him, instead of just waiting until his back is turned and mouthing bad words at him like most normal parents. As more and more of the bits of the story in the Babadook come true, Amelia begins to believe in the story herself and starts seeing the figure in the darkness around her home, which for some reason she keeps shadowy and dark. But the true Babadook may have already found its way inside Amelia herself. The Scariest Part Of The Movie: I’m guessing to a parent it’s the thought that you could ever hurt your own child, because kids can be annoying. To somebody like myself who doesn’t have kids, it’s that kids are pretty much that annoying all the time. Our Hero’s Downfall: Gettin’ knocked up. Seriously, Amelia could be well-rested and not knowing anything about the Babadook the entire movie. 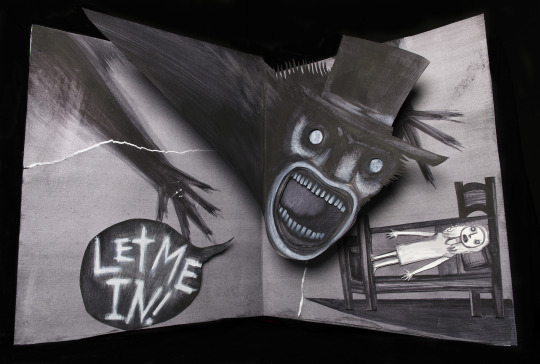 Could It Happen: Probably not, but if I ever do have kids I’m going to show them this around age 4 and then threaten them with some Babadook constantly. Can’t you kids see daddy’s napping? Spookiness Factor: 8 out of 10. I have never been so scared of something in a top hat.